Felix Salmon has a very interesting post, detailing the fight between Simon Lack, author of The Hedge Fund Mirage: The Illusion of Big Money and Why It’s Too Good to Be True, and the Alternative Investment Management Association, which I presume represents the sales departments of a bunch of hedge funds. Basically Lack's thesis is that hedge fund managers do beat the market, but keep all of the excess returns for themselves. The size of the two surpluses is determined by the slopes of the curves, which are called the elasticities of supply and demand. 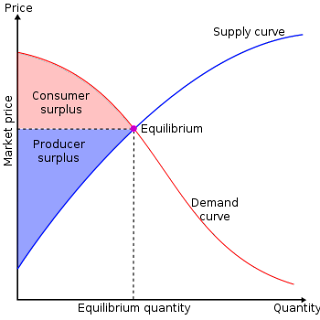 If demand is highly elastic - if the demand curve is close to flat - then the consumer surplus will be very small, and most of the benefits of the market will flow to the producers. Think of hedge funds as producers and investors (who can give their money to hedge funds) as consumers. What do hedge funds produce? They produce "money tomorrow", and the price is "money today" (this ignores risk, but let's go ahead and ignore risk for the moment). So "money tomorrow produced by hedge funds" is the commodity being supplied in this Econ 101 diagram, and "money today" is the units of the price. Econ 101 teaches us that demand curves are more elastic when there are substitutes available. For example, if New Balance shoes cost $60, and are just as good as Nike shoes, then as soon as Nike raises its price to $65, consumers will buy a lot fewer Nike shoes (because they will flock to New Balance). When the commodity is "money tomorrow supplied by hedge funds", there are many close substitutes available - money tomorrow provided by index funds, money tomorrow provided by Treasury bonds, etc. So we expect demand for hedge funds' products to be highly elastic. That means that the consumer surplus will be small. The producer surplus, on the other hand, might be pretty big, because different hedge funds probably have very different costs of production of "money tomorrow". A great fund manager might be able to produce a dollar of "money tomorrow" for only 70 cents today, while a mediocre manager might have a cost of production of 95 cents. Since production techniques can't easily be copied (investing techniques are secret), this producer cost heterogeneity should persist. Hence, there will be a big producer surplus - great managers will rake in the cash while mediocre managers will scrape by. This will show up as large excess returns to fund managers, which are extracted from investors via large fees. So Econ 101 tells us that our baseline expectation should be that while hedge fund managers might beat the market, investing in hedge funds is unlikely to let you, the customer, beat the market. Which is Simon Lack's main result. Of course, so far we've ignored risk. Many hedge fund sales departments, including the AIMA, are eager to remind investors that hedge funds can help you diversify your portfolio even if their after-fee rate of return is no better than any other asset class. This is true. It is true because hedge funds have access to investment opportunities that retail investors and mutual fund managers lack. So you might want to give some of your money to hedge funds (even at below the safe rate of return! ), just to have indirect access to these other assets and thus diversify your portfolio. Also, according to efficient-markets theory, hedge funds in general will have to offer above the safe rate of return (i.e. Treasuries) if most hedge funds take on a bunch of non-diversifiable risk. In this case, giving your money to hedge funds would be pretty much like buying a bunch of risky stocks. You get more returns, but only because you are able to demand those returns in exchange for committing your capital to risky projects. And finally, if you have some special way of picking which hedge funds will perform the best, then of course you should give your money to those funds. Which basically means that you, yourself, are a market-beating manager of a fund-of-funds. So there are certainly possible reasons to give your money to hedge funds. But these are side points. The main point is that, if we believe in supply and demand, then we should not expect hedge fund managers to give you their winnings when they could keep the winnings for themselves via fees. Which they usually can do, since the elasticity of demand for "money tomorrow" is high. Simon Lack's results should not especially surprise anyone who believes in Econ 101. If hedge funds are facing a rather flat demand curve, and have a MC that is lower than the current price of money tomorrow, the profit maximizing decision is to lower the price. I agree with your conclusion - there is no reason for hedge fund managers to give their winnings to you - but have serious doubts about explaining this with supply and demand. How do you define a demand curve when the consumer has no idea how much 'money tomorrow' she is actually purchasing? The price of money tomorrow is a little easier to work out, but not much. So Why should anyone ever start a business ? Because they are looking for a certain risk/reward ratio. Other than the qualitative reasons of course. I think central to the story is the story of risk and the same logic applies to hedge fund investors too. Basically the rewards of being say in the top 25% earners from Hedge Funds is worth the risk which includes the fact that net net investors gain not much over treasuries. A big reason many people start a business is because they either don't understand risk, opportunity cost, etc or because they are risk lovers. Nonetheless, society should be grateful for the actions of these unreasonable people. Their willingness to risk almost certain failure does occasionally lead to innovations we all benefit from. Evolution has proceeded such that there is a mix of mostly risk averse people, with some risk lovers willing to push the frontier. Could you imagine the chaos if the vast majority of us were risk seekers? I don't think our species would survive too long. The critique of hedge funds Felix and Noah are getting at is that they are probably not the right investment for the vast majority of investors, who are risk averse. 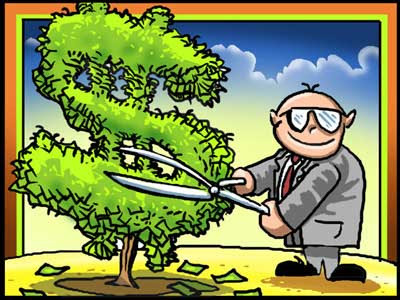 Hedge funds have a profit motive to convince as many people as possible to invest with them. Investors need to understand their risk tolerance, ignore hype, and invest with caution. You miss my point. I am not saying that entrepreneurs are wrong, as in morally, for starting ventures. By saying they either don't understand risk or are risk lovers, I mean they are willing to take huge risks despite the very bad odds. As you even state in your first post, the vast vast majority of businesses fail. Without getting too technical or long winded, risk, from a financial/economic point of view, essentially defines the probabilities associated with payoffs in different (future) states of the world. With the payoffs and associated probabilities we can calculate a risk's (gamble's) expected value. Which, roughly, is the average of the possible payoffs one can expect in the future. Most people are risk averse, which is defined as rejecting a fair gamble: a gamble with an expected payoff of zero. Since all this is a human concept, and thus has a large degree of subjectivity to it, I would say, yes, the risk averse, being the majority, do "understand" risk better than the risk lovers. I was honestly saying thanks to the risk lovers, because we do need *some*. My point was that since most people are risk averse, they probably should follow their 'hearts' and be on the side of caution with their nest eggs. But if you Kabir, have the guts to go off and start a company, do it. You will probably give at least a few people a job until it fails (which is likely, as you said) or you might just make the next Apple. Just read that Steve Jobs biography a little closer. He loved building his empire, but he very strongly regretted the time he missed with his wife and kids. Time is the most ignored opportunity cost. Because lots of entrepreneurs foolishly believe they will beat the odds and succeed, a few actually do and we get successful businesses and the products and services they bring to the economy. Because lots of investors foolishly believe they will beat the odds and succeed, we get hedge funds, and... ??? We are not in disagreement here about anything but the philosophical implications. I suggest you spend some time and think about what they are. Just like someone "unreasonable" has to take a chance on a new business when history tells them never to take such a risk, the investor in that project has generally to take at least an equivalent risk betting on it with his money. A Hedge fund at the least provides liquidity in a market and at best are known to invest in very small companies which are very high risk. Hedge Funds are basically bets on all things which look unreasonable to the rest of the world. Which is why I find all of this analysis mildly amusing. Some become altruistic though, like Salmon Khan of Khan Academy. What fraction of venture capital comes from hedge funds? My understanding is that they mostly trade rather than invest. Lack's other key point is the expense side of the equation. Most HFs use the 2&20 approach while mutual funds clearly win on this and of course self-directed investing (with the caveat that you are likely not any smarter than the HF manager) is much cheaper as well. When this is factored in HFs are even worse than what you show above. This also doesn't take into account information asymmetry. The information is most asymmetric between buyers and sellers for hedge funds, as compared to other investment types, in terms of the investments used, the methods for which commissions and fees are charged, etc. I suspect that this effect dwarfs the S/D effects noted here. Also, according to efficient-markets theory, hedge funds in general will have to offer above the safe rate of return . . .
Actually, according to efficient-markets theory, hedge funds in general cannot consistently out-perform the market. actually the real problem is that hedge fund managers can game the tax code and call their labor income something else and gain a tax advantage. there is really no reason we should be subsidizing this industry (more than any other: i am also against ethanol, farm, and wind subsidies, i am an equal opportunity tax expenditure basher). i wonder what returns to investors would look like without this taxpayer subsidy. I'd go further and say there is no reason we should be subsidizing capital gains over other sorts of investment; speculating in asset bubbles is not more beneficial to the economy than starting a small business, and growth stocks are not better for the economy than dividend stocks. I'd further add that there is no reason to subsidize investment income over labor income; we are not constrained by any lack of money on Wall Street and you don't build a functional dynamic economy by making sure the easiest way to make money is to already have it. The real caveat is that we don't really know how well many hedge funds are performing. They are private, any public return information is provided, *cough made up (potentially), by the firms and not scrutinized by any auditors or federal regulators. Similar issue that exists with private equity, venture capital, etc funds. And don't get me started on quant firms. Because of this there is very little empirical work done on hedge funds so far. As a believer in at least the weak form of the efficient market hypothesis, I would be surprised if, over the long-run, hedge funds do any better than passive (low fee) diversified index funds. Even good enough to justify Noah's theory that they may provide such effective risk diversification that a rational investor would be willing to accept a return below the risk free rate. Efficient markets hypothesis says there is no place for hedge funds. All financial instruments trade at their true value. This is not what the efficient market hypothesis states. It states that at any point in time predicting which financial instruments are not traded at their true value is a 50/50 chance. Moreover, you skipped over a couple of paragraphs of Noah's post. There is the benefit of hedging through diversification even if returns do not beat the market. What Anon said is roughly what part of the EMH says. My rough and ready definition of strong form EMH: there is so much competition by *rational* participants for information on assets, that any genuine news will be instantaneously reflected in the assets's price. So the assset's current price is its "true" value. Since genuine news is, by its nature, unpredictable, speculation by using technical analysis, fundamental analysis, psychics, etc is useless. 50/50 is probably as good an odds as any that your "insider info" will prove correct. The Strong EMH requires two key assumptions. (1) rational investors and (2) no trading frictions. We know reality does not meet this requirements. Behavioral economists have shown experimentally, that most people are not terribly rational when investing. Clearly we have trading frictions: transaction costs, markets aren't open 24X7, people have to sleep, etc. Clearly, it is a theoretical construct. Even one of its developers, Eugene Fama, has recently stated in a paper that the weak form is much more realistic. If interested, Google "Efficient Capital Markets: I1" and you can find an ungated version at Univ of Chicago website. Fama's papers are fairly approachable, even for the layperson. The word "roughly" is key here. 1. Not all participants need to be rational for EMH to hold. Keep in mind that in a world with information costs, picking stocks can be worthwhile if you do the research, while the weak EMH still holds. Yes, true, but only so long as you are one of few. Given the number of financial firms and analysts involved in business, what is your take Noah? I know I am shooting myself in the foot professionally, but I believe that socially we would be better off if some of these analysts were medical doctors or engineers, wihout much impact on the efficiency of financial and asset markets. Forgot to add, and only if the benefit in terms of the return exceeds the cost of obtaining that information. Why are you shooting yourself in the foot by saying that? I think most finance industry workers would LOVE to have fewer people trying to take their jobs. As for whether we have more than the socially optimal number of analysts, I have no idea at all. Yes, but as an econ prof this means fewer students taking econ courses. This article misses the basic point. The reason investors use hedge funds is the same reason they buy a Rolex watch to tell them the time. There is prestige and they pay a huge premium (and accept the opportunity cost of that money) for that prestige. I heavily doubt this, since you don't wear your hedge fund manager on your arm. Noah. Leaving aside the value of hedge funds, your comment about demand elasticity is erroneous. Under Perfect Competition, perfectly elastic demand curves occur at the firm level, not the market level. Otherwise we cannot have maximum consumer surplus which is an essential feature of Perfect Competition. When you compare Nike vs. New Balance, you are comparing firm to firm. You are not comparing the running shoe market to the TV market. From my perspective, it is not the demand elasticity that matters, but the informational advantage hedge fund managers have that give them a higher Producer's Surplus. If you add volatility to HFMs alpha then you can have mutually beneficial trades where the managers give edge to the investors in return for reducing the volatility of their income. I think thats pretty much the same as any business.